I can’t change YOU. And YOU can’t change ME. But TOGETHER we can work to change the world! There will always be a reason why you meet people. Either you need to change YOUR life or you’re the one that will change theirs! 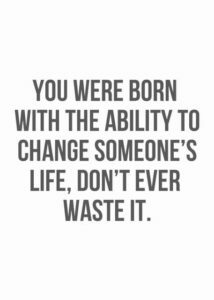 And when you do what I do, you get the chance to cross paths and create friendships with those who will change your life just as much as you will change theirs! Meet Paul Kosby. We met years ago. We’ve stayed in contact and build a friendship built on respect and trust. 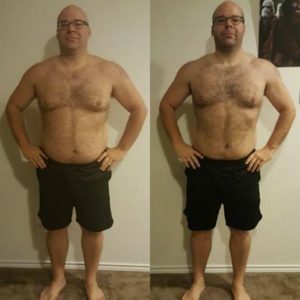 I have gotten the pleasure to help him restart his journey after a few setbacks and watch him transform his life and health and body. Please help me give him a shout out for taking charge of his life, accepting help and support and not being afraid to share his journey and results, in efforts to stay accountable to his own goals and inspire others on the way! Congratulations Paul on your 35 lb. weight loss in under 3 months and being coachable, RELENTLESS & hungry in the pursuit of happiness & success! Monica and I spoke for the first time in early November. Her goal was energy. She lacked energy. It wasn’t about weight loss or even a size. All she wanted to do was to be able to keep up with her sons (3 1/2 & 15 months). She also wanted to feel more confident. Less than a month later, after tapping into ALL of the resources I offered my challengers, she decided she wanted to pay it forward. She wanted to help others. Her confidence is up and her goals have shifted. And her energy is WAY UP! Win. Win. Win. This is Lynn. She’s part of the fit-family that I’m constantly talking about. 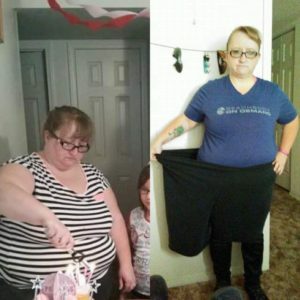 She’s lost 101 pounds!!!!!! She wasn’t deprived. She didn’t eat PERFECTLY, instead she ate SENSIBLY by eating clean using our perfectly portioned portion-control containers and worked out daily for 30 minutes!!!!!! I know there were days when she was tired. I know there was days when she faced temptation and struggled. But she didn’t give up. Not on herself or her goals. She worked as if her life depended on it. Because it did. She stopped making excuses and got the results she worked for!!!! 🚫 STOP putting your health on the back burner, You can’t afford it!!!! STOP putting yourself and your needs dead last. STOP convincing yourself that you’re not worth it; that there’s no use in trying; that you’re destined for sickness and obesity because it’s prevalent in your family. STOP using time as your excuse. You have time. STOP using money as your excuse. It’s not that people can’t afford it, it’s that people can’t afford to continue their same lifestyle and make the change that’s necessary. But why continue supporting and feeding and financing a lifestyle that will lead to a quicker death or an unfulfilling life? STOP teaching your children to reward themselves with food. STOP telling yourself that it’s your family that holds you back. Are you ready to STOP the cycle and pattern of living that’s gotten you depressed and frustrated and has left you lethargic and apathetic??? If so, it’s GO 🏁 time. Let’s GO … let’s do it TOGETHER. …. if not NOW, when?? If you are looking for a change, are you ready to accept the challenge that it will take to achieve RESULTS that will change your life and outlook on YOUR life? My December Online Support Group has begun and you are invited to join us! This group is designed to help women really stick & stay focused on their health & fitness goals for end of the year in order to get amazing results by the beginning of 2017. Self-love, nutrition & taking care of your wellness is so important, as an individual and especially as a wife/mom & that will be our focus! Each month I am looking for 10 women who need to be reminded of their worth; 10 women who’s gut instinct is to tell themselves that it’s too much money to spend on themselves, especially when they could spend hundreds, maybe even thousands this holiday season on their loved ones. I am looking for 10 women who I can prove to, that you MUST put on YOUR OWN oxygen mask before you can truly be your best, the best that you are trying to be for your family. I am looking for 10 women who understand that their current lifestyle is not bringing them happiness or health, which will only make the holiday season depression, instead of enjoyable. I am looking for 10 women who need the extra reminder and push to STOP them from putting themselves dead last! I know how hard it can feel to invest in yourself during this time of year because it feels like if you spend money on YOU, then you are taking away from your family. I know because I remember feeling not just horrible but MISERABLE from May 2011 through the end of the year and STILL waited until the END of January 2012 to finally invest and commit to changing the lifestyle that brought me pain, misery and depression. And my ONLY regret about the money I spent & decision I made to stop talking and complaining and DOING on 1/28/2012 is that I ONLY WISH I HAD OF MADE THE DECISION SOONER or found my coach, Becky who helped me change my life, sooner! We as a team, myself as an individual and our family is working towards a HUGE goal and would ♥LOVE♥ your support in joining us on our journey! Our team is SOLID and NOT going anywhere, which means your support and motivation will be NEVER ENDING! As many of you know this is a MAJOR time of year for our family business and we have a very specific goal that I am working towards, which includes our entire team and will set the tone for 2017!!! This is a goal that supports not only my business but my family! Will you allow ME to help me help you!??? HAVE THE TOOLS TO HELP YOU KEEP THE WEIGHT OFF and kick off 2017 on the right track instead of 10 lbs heavier! 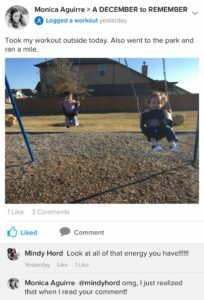 You DO NOT have to post or share on FB! Or get on any virtual calls. Or attend any live events. This is really a win-win and would be a beautiful partnership!!!! Let’s be partners on purpose.